Manage your Payments MB customers & payments inside Freshdesk. Payments MB - All your payment processing solutions in one place. ChargeDesk has full support for PaymentsMB. Connect your PaymentsMB account to ChargeDesk and you'll be able to deliver remarkable billing support for all your customers. ChargeDesk uses a unique algorithm to find all of the Payments MB charges & customers related to any ticket you receive inside Freshdesk. Where direct matches can not be found, related charges are also be displayed in case the customer is using a different email address or name. ChargeDesk integrates continuously with Payments MB. This means that your data is always kept in sync on both platforms, no matter where you make a change to your customers. Once you connect your Payments MB account to ChargeDesk, you'll be able to deliver remarkable billing support for your customers in seconds. 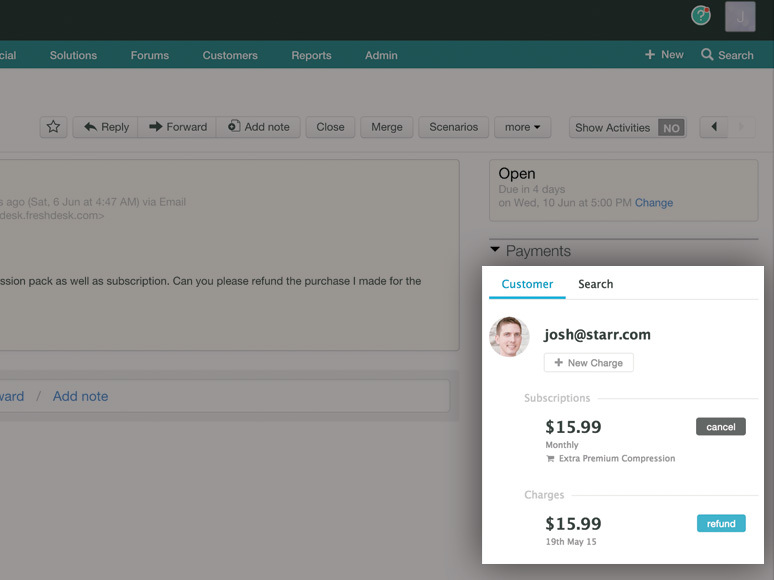 ChargeDesk enables you to have complete control over your customer's information. This allows you select which of your support agents can view and make changes to customer information. Any changes made by your agents are logged and easily accessible both online and in downloadable report form. ChargeDesk helps you follow best practices to cut your chargeback rate. Every charge is a pathway for the customer to get in touch with you directly when they have a dispute, rather than going to their bank. You can resolve the issue before it turns into a chargeback. This leads to happy customers and lower churn rates. Do your customers request payment invoices for their records? 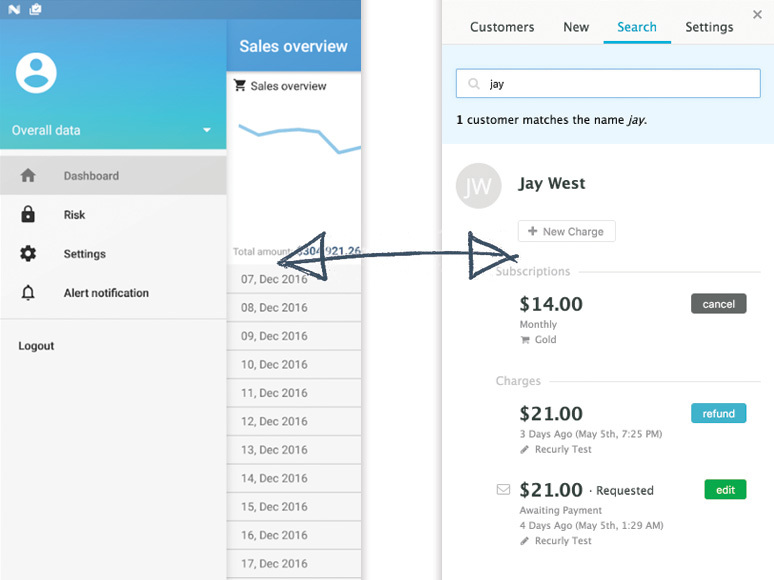 ChargeDesk allows you to turn on automatic PDF invoices which are attached to all email receipts. You can easily configure all necessary tax information from your ChargeDesk settings. You can search for the last 4 digits of a credit card, by email address, customer name, username and more. This allows you to immediately find specific charges for a customer without spending time hunting through multiple systems. With ChargeDesk you can connect multiple payment gateways to the one account. This means that if you have, say, customers in both Stripe and PayPal, you can manage them all inside Freshdesk. This happens transparently, so you can refund charges, manage subscriptions or create new charges for customers without needing to know which gateway they are supported through. Your first 14 days of using ChargeDesk are free of charge! This allows you to test the service and in the (incredibly unlikely) case you find it's not for you, you pay nothing. With the ChargeDesk application you can refund any charge right inside Freshdesk. Partial and full refunds are supported. Refunds a processed immediately and you will receive feedback on their success. Once a charge is refunded it will show as such inside Freshdesk. 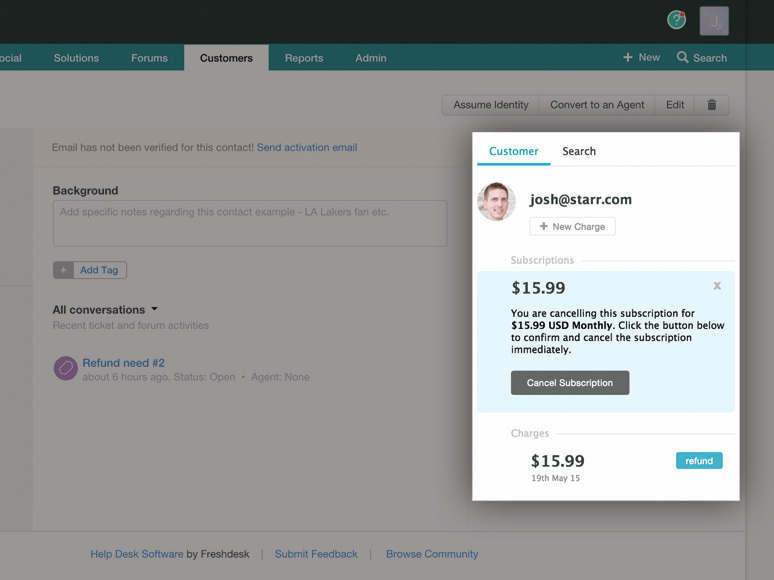 Any active subscription will have a button that allows you to cancel it immediately inside Freshdesk. Customer and subscription details update in real time so you are never working with stale or out-of-date information. 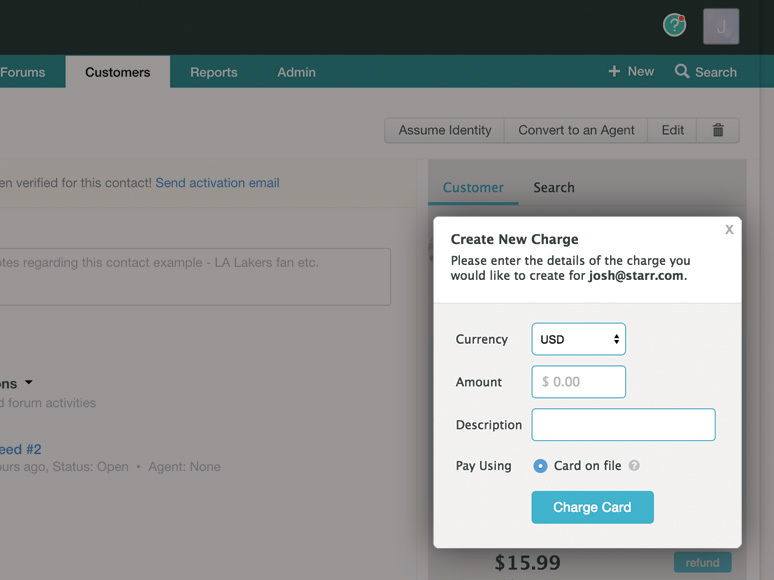 You can use ChargeDesk to create new charges on cards on file for your customers inside Freshdesk. This will be processed immediately on your payment gateway and you can download a tax invoice to send as a record to a customer. Every receipt makes your customer feel loved. The responsive design looks great on every device and each email links directly to a unique support page for the charge. Replying to the receipt will create a ticket in your helpdesk with the full details of the charge included. Email receipts are optional - you can use the rest of ChargeDesk's features without activating them. 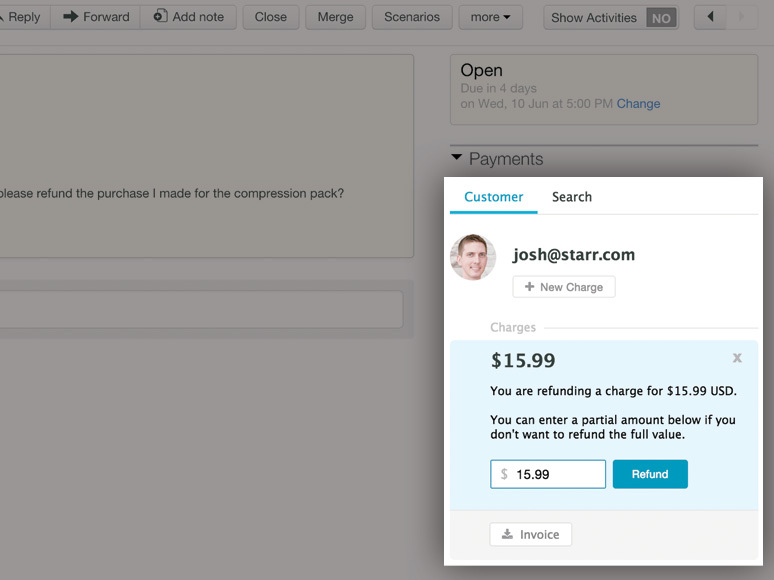 ChargeDesk will generate a custom billing support pages for every Payments MB payment you receive. These pages allow your customers to immediately see the current status of their payment and how it will appear on their bank statement. These pages also serve as a point where your customers can bring questions or disputes about their charges directly to you. Like email receipts, any questions which come from these pages will have all the related billing information attached in your helpdesk so you never have to guess which charge a customer is asking about. Security is a key feature of ChargeDesk. We've spent countless hours hardening our systems and ensuring we use advanced, strong encryption wherever possible. We encrypt data both in transit and while it is stored on our servers. We support 2 factor authentication on any account. Read more about ChargeDesk Security. Connect Freshdesk and Payments MB Supported Features for Payments MB Ask us Anything! Help, I've forgotten my password! You can sign up with either Payments MB or Freshdesk first. You will be prompted to connect the other provider once the first is connected. No matches found for ''. Request support for this gateway or helpdesk.